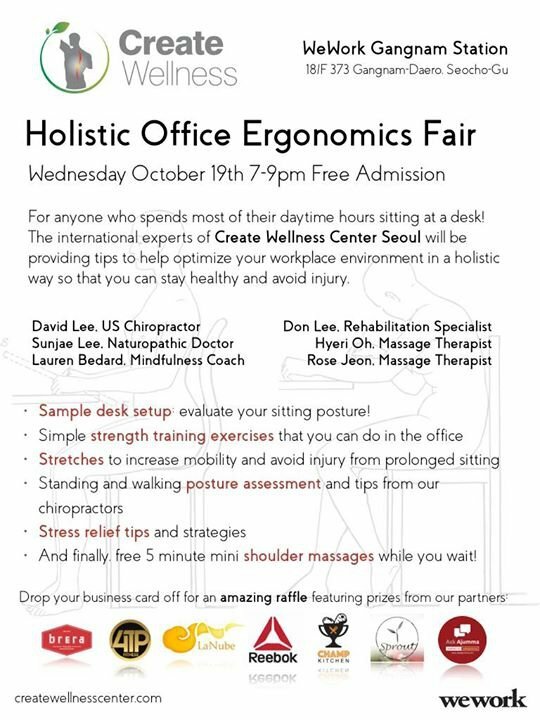 On Wednesday, October 19th, 7-9PM, the specialists of Create Wellness Center will lead an Office Ergonomics workshop, hosted by the new facilities of Wework Gangnam Station. Dr. David Lee, a US trained chiropractor, will first give a short presentation on optimizing posture and avoiding injury, followed by several 'stations' where people can test out their workplace posture, get free advice from our specialists, talk with a meditation coach, get nutritional advice, and even get a 5 minute shoulder massage from our massage therapists. As with all of Create Wellness Center's community events, there will be a free raffle where people can win amazing prizes from local restaurants, fitness facilities, and more! The event is free and will be held on the 18th floor of Wework Gangnam Station.